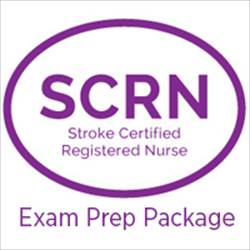 The SCRN Exam Prep Package contains three of AANN’s best-selling products: SCRN Review Course, SCRN Self-Assessment Exam, and the AANN Comprehensive Review for Stroke Nursing book. When you purchase the SCRN Exam Prep Package, you save $60 compared to buying the products individually. 1. 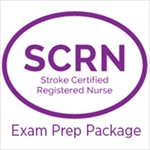 SCRN Review Course: The SCRN Review Course is a web-based review that includes interactive videos and quizzes to help you prepare for the SCRN exam or to review stroke nursing best practices. The online course is a self-paced study tool, earning 8 CE hours upon completion and evaluation of the course. Based on the Comprehensive Review for Stroke Nursing book and the SCRN exam content outline, the course includes ten modules. Key interactive features include progress checks, correct answer descriptions, and videos to emphasize key concepts. 2. SCRN Self-Assessment Exam: The self-assessment examination is 75 questions in length and parallels the actual SCRN examination content outline. 3. AANN Comprehensive Review for Stroke Nursing book: The AANN Comprehensive Review for Stroke Nursing is a comprehensive resource for nurses preparing for the SCRN exam and those looking for a review of current best practices for providing stroke care. This evidence-based book covers key topics listed on the SCRN exam blueprint, including anatomy and physiology, preventative care, hyperacute care, stroke diagnostics, acute care, medications, postacute care, and systems and quality care.